As I drove down Capitol Boulevard (clever name right) I watched the impressive Idaho State Capitol Building manifest in front of me. It stood at the end of the street as a massive giant. 1. 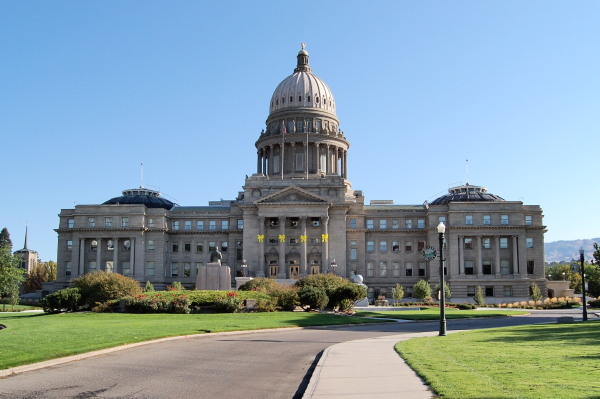 Idaho’s first capitol was not Boise. It was the port town of Lewiston, a few hours to the north ( yes – you read that right, Lewiston has an actual ocean port). Idaho became a territory in March 1863. Due to Lewiston’s booming growth it was decided to put the capitol there. 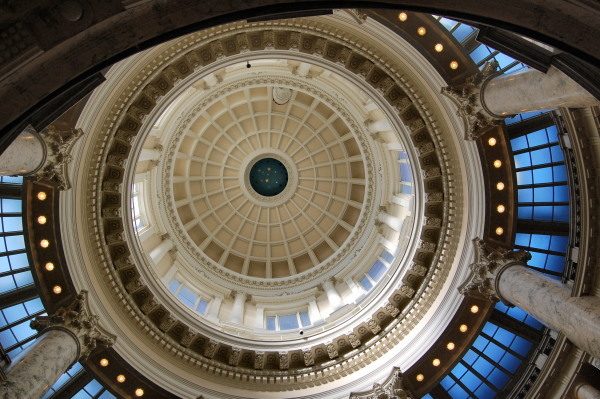 Due to a population shift in 1890 the capitol was moved from Lewiston to Boise. It was a difficult change for Lewiston and was contested for many years. 2. 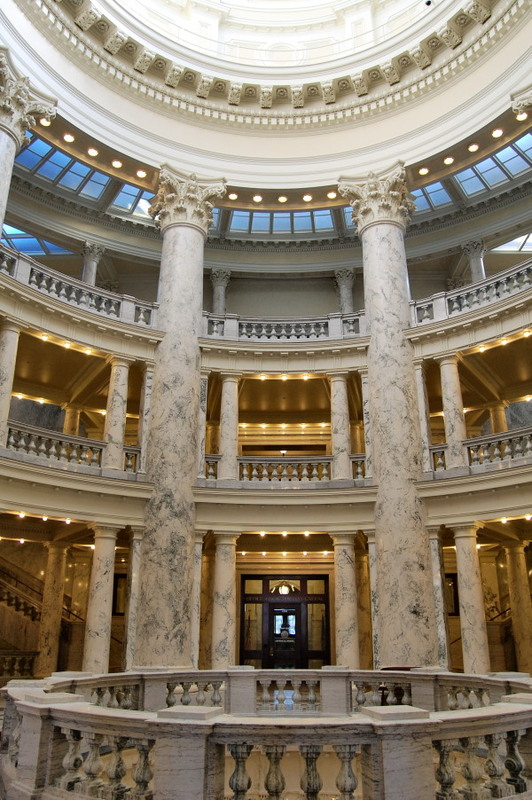 The Idaho Capitol Building was originally constructed by local inmate labor starting in 1905. The main part of the building was finished in 1912. Later east and west wings were added from 1919 to 1921. Remodeling took place during the 1950’s and 1970’s and about $3.2 million USD in repairs were made to the building after a fire broke out in 1992. The last “face lift” the building received was in 2007 to 2009 adding more space, upgrading electrical and repairing some of the marble. 3. 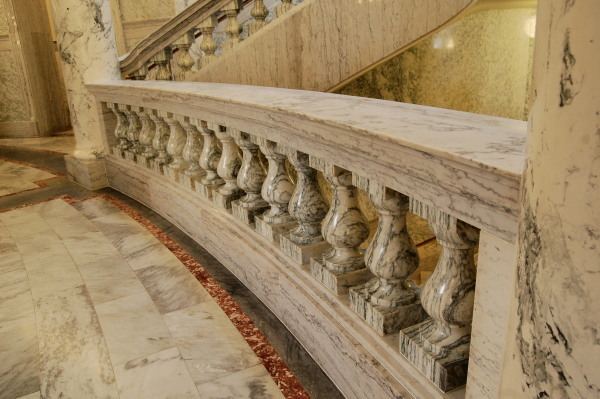 Speaking of marble – the capitol’s interior is stunningly beautiful with walls and floors of marble. Large pillars also have the appearance of marble but are actually scagliola, a mixture of gypsum, glue, marble dust and granite dyed to look like marble. Although there is plenty of marble to admire, the scagliola was used to cut down the cost of the marble… and hey it’s a pretty good fake – I would have never known if I wasn’t told (not that I’m a rock expert or anything). 4. The building is referred to as the “Capitol of Light”. You will notice it is a pretty accurate description as you stand inside. The warming sunshine from outside pours in through the windows. The most impressive part of the building is the rotunda. It helps bring the light into the building as well as giving you a captivating focal point. The best place to see (and get a good photo) of the rotunda is from the 1st floor, a level up from where the visitors center is. 5. If you are Idaho’s Governor I hope you like antiques. The Governor’s desk has been around since 1919. Although not all the furniture is original. To keep the historical look of the building replicas and reproductions of the original furniture were put in place during the 2009 restoration. 6. 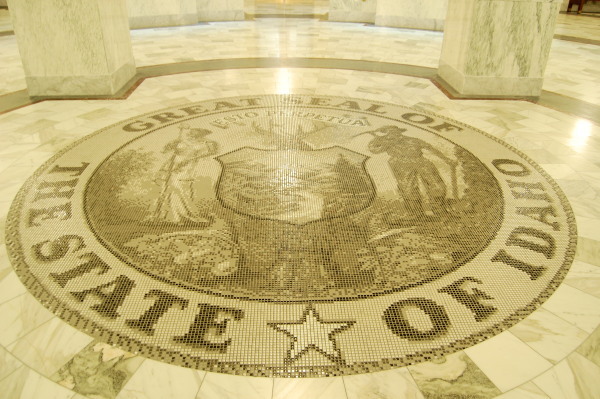 Idaho has had three different State Seals. The 1863 Seal for the Territory of Idaho, an 1866 updated version for the territory and the seal that is in use now, which started being used in 1957. The seal has the Latin words “Esto Perpetua” across the top of the seal. Esto Perpetua can be traced back to the Venetian mathematician Sarpi, who’s reportedly last words were “Esto Perpetua” which translates into “Mayest thou endure forever”. There is a pretty impressive tiled version of the seal downstairs in the visitors center if you want to get an up close view of the seal. 7. 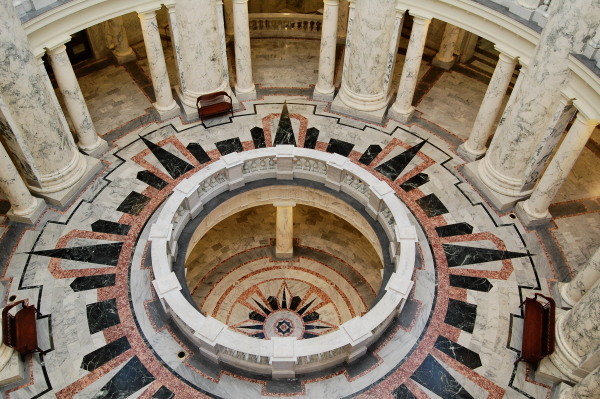 Both self-guided tours and guided tours are offered of the Capitol Building for free. Guided tours are 1.25 hours long Monday – Friday at 10am and 1pm. If you want to take a guided tour you will need to reserve a spot by calling 208-332-1012. Make sure you book 2 weeks in advance. If you take the self-guided tour, like I did, I would recommend starting at the visitors center so you can pick up a tour pamphlet. The visitors center is located in the basement. You can enter from the street level, or you can enter the building through the front doors at the top of the impressive front steps. 8. Lastly this has nothing to do with the Capitol Building however still worth mentioning as I travel with a dog and you may too. You may not be able to bring your fur baby into the Capitol Building but the park in front of the Capitol is pet friendly. There are also park benches, tables and large shade trees that would make for a nice picnic! 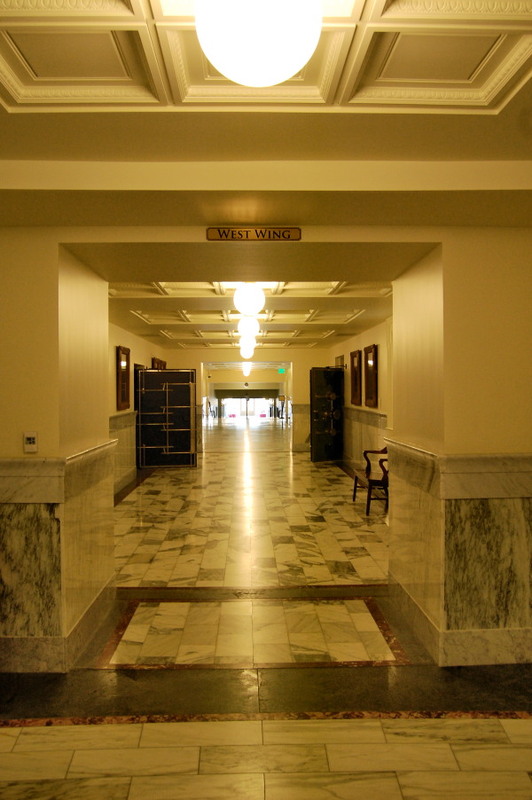 If you would like to visit the Idaho State Capitol Building it is located at 700 W Jefferson St. You can visit while legislation is in session (January – March) from Monday – Friday 6am to 10pm and Saturday-Sunday 9am – 5pm. If they are not in session (April – December) you can visit Monday-Friday 6am – 6pm and Saturday-Sunday 9am – 5pm. Tagged facts about Idaho capitol building, idaho capitol building, state capitol buildings, touring idaho capitol building. Bookmark the permalink. Thank you! In my opinion you drove through the best part of the state if you were up north! This is an excellent and thorough post, Brittany! You also have really good pictures to go along with each description. I personally love visiting capitol buildings. The most recent one I visited was in Providence, RI. On this same trip I drove through Salt Lake City and almost stopped at Utah’s capitol building there. Now I wished I did – maybe compare the two 🙂 That’s really cool that you visit the capitol buildings. Very cool! The photos are great and your fun facts are indeed fun! Thanks Amanda! It was fun for me to learn a few things that I did not know about my home state! Wow, what an impressive building! Love the rotunda shot. That’s an impressive capitol building. And you’ve gotten me looking up Lewiston – it’s crazy that Idaho has a port! I’m always fascinated by places that used to be capitols and then fell from glory. The building is pretty cool with all the stone work it has. I recommend making a stop if you are ever in the area!